This timeline is a collection of interesting and significant events. In a few cases, sadly only an oral source can be cited. One-time student at what became Princeton University, original US Senator from NC, and United States Agent to the Creek Nation Colonel Benjamin Hawkins, whose 1796 writings depict Creek society, may have been among the first English-speakers to pass near what would become Buchanan, GA.
Floyd Gammage builds a double log cabin on what is now the city square. He lives there one or two years and sells to Fred Glass. Fred Glass sells his land on the will-be city square to Jesse Jeanes. Thirty acres of land are cleared during these early few years. The area in which Pierceville (now Buchanan) will be founded in the next year is shown in this map. Georgia creates Haralson County from abutting parts of Carroll and Polk Counties on the 26th. County business is to be conducted at Tallapoosa until county officials are chosen. Oath of office given to the original Justices of the Inferior Court and other county officials. On the 14th, after some bickering as to where they would locate the court house, the Inferior Court accepted Jesse Jeanes' offer of forty acres, and located on his property, and called their town Pierceville. [now Buchanan] (The quote is from the August 24, 1906 memoir of "Old Timer", published in Buchanan's The Tribune.) On the 22nd in the US Senate chamber, US House Representative Preston Brooks (SC) attacks Senator	Charles Sumner (MA) from behind with a cane, disabling him from service for three years. The civil war in Kansas between free-soil and slave-holding settlers reaches the halls of Congress itself and shocks the nation. Roads ordered built from Pierceville toward the following: "Villerica", Carrollton and Cedartown. 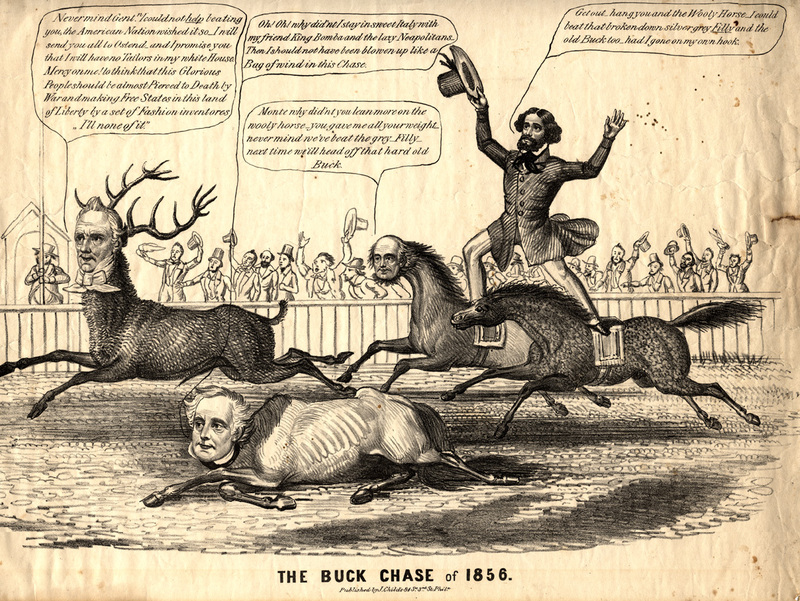 Democrats nominate James Buchanan (Old Buck) for US president, shunning Democrat Franklin Pierce, the incumbent. Roads ordered built from Pierceville toward the following: Jacksonville (AL), Van Wert, Pine Grove Academy (Tallapoosa area), Draketown (then in Paulding County) and Arbacoochee (today a tiny place 5 miles southeast of Heflin, AL). Voting probably takes place at the "public building" on the land deeded for the new county seat in May, one of the double log cabins built by Floyd Gammage about 1851 or 1852, used for the first superior court term. James Buchanan is chosen US president by the electoral college. On the 29th he writes: The great object of my administration will be to arrest, if possible, the agitation of the slavery question at the North, and to destroy sectional parties. Should a kind Providence enable me to succeed in my efforts to restore harmony to the Union, I shall feel that I have not lived in vain. Map of the area in which Pierceville (now Buchanan) is founded in this year. James Buchanan is inaugurated as the 15th president of the United States on the 4th. On the 6th, the US Supreme Court rules 7-to-2 in Dred Scott v. San(d)ford that people of African descent, whether or not they were slaves, could never be citizens of the United States, and that Congress had no authority to prohibit slavery in federal territories. Many abolitionists and some supporters of slavery believed that the court would next rule that the states had no power to prohibit slavery within their borders and that state laws providing for the emancipation of slaves brought into their territory were likewise unconstitutional. Buchanan vainly hopes the decision will quell unrest in the country over the slavery issue by putting the future of slavery beyond the realm of political debate. First Haralson County courthouse ordered built at the exact town center. The original specifications had provided for a foundation twelve inches under the surface to be laid with rough rock. The house to be thirty-five feet square, the walls to be built of good brick two stories high. On the 14th of this month the Inferior Court orders that ten feet be added to the west side of the building and obligates itself to pay the contractor $630. The county Ordinary's minute book refers to "Buchanan," rather than "Pierceville". George R. Hamilton becomes the first federal postmaster in Buchanan. Buchanan is incorporated as a TOWN by Georgia on the 22nd with a 1 mile diameter circular extent. The original five town commissioners appointed to serve until the election of Jan 1859 are T. C. Moore, W. N. Williams, Thomas Farmer, John Duke & Mr. Coston. (A modest attempt in Dec 2007 to track down more biographical data of them fails.) The act specifies: On the first Saturday in January annually [starting in 1859], all free white males living within the corporate limits of said town, who are entitled to vote for members of the Legislature, shall be entitled to vote for the election of five commissioners. John Marey was ordered paid for furnishing and erecting lightning rods on the courthouse. The original Tallapoosa lodge of Masons moves to Buchanan. George T. Carroll was ordered paid $1,500 in drafts for building the courthouse. On the 2nd Georgia voters go to the polls and select delegates to a convention which would decide the issue of state secession from the United States. In many counties candidates divide along two divergent views. Immediate secessionists advocate leaving the Union at once, while cooperationists are more conciliatory, ranging from devout unionism to a desire to postpone any secession commitment. An analysis published in Georgia Historical Quarterly LVI (1972), 259-75 shows a very close popular vote, offering a best estimate of defeat of the immediate secessionists by 42,744 to 41,717. Political speeches, newspapers, and the contentiousness of state leaders reveal the deep divisions over the issue at the time. At the convention, Alexander Stephens, who in the end would serve as the Vice-President of the Confederate States of America, argues secession is an unwise measure, but there are conflicting claimsabout what he says. In the end, the final convention vote on the 19th reveals a major shift of opinion and immediate secession triumphs 208 to 89. Haralson County's reps William J. Head and Abner R. Walton vote with the majority; neighboring Polk County men vote the other way. It is proposed that the town name be changed from Buchanan to Bartow. Today the name Buchanan is still in use; did the Pierce-Buchanan switch eventually persuade people against changing the human namesake every time the old one falls into disfavor? The county Ordinary minute book spells the county seat as "Buckhanan", suggesting the current (2007) pronunciation was also in use then. On the 24th, the legislature incorporates the North & South Railroad Company of Georgia for the purpose of constructing a railroad from the city of Rome, Georgia, via Carrollton and LaGrange, to the city of Columbus, Georgia. Might this railroad lay track through town? Its members include Wyatt Williams, Walker Brock, William J. Head and Richard C. Price, of Haralson county. Buchanan is marked on a new map. Note the never-built east-west railroad which was to have passed through Carrollton. Bridge for road from town to "Villarica" to cross the Little River approved for $87 to low bidder N. L. Goldin. The North & South Railroad Company of Georgia is reorganized as the Columbus and Rome Railroad Company. It would never build track through Haralson County. Buchanan Methodist Church organized at first Haralson County courthouse; a wooden building will house the church.